Earnest Swann has gone back to work at the American Bridge Company in Birmingham. Mr. and Mrs. Earnest Hancock and boys spent the weekend with Mr. and Mrs. Buster Allred and family, in Decatur. Mr. and Mrs. O.D. Haynes, of Auburndale, Florida, are visiting friends and relatives here this week. Leroy Campbell spent a few days last week with Mr. and Mrs. Clarence Brown and Larry Dale, of Pleasant Grove. Reverend J.B. Thompson has been ill and in the Jasper hospital. Funeral services were held this afternoon at 3:00 p.m. for Mrs. Birdie Mae Glasscock, 78, who died at her residence, on June 15th. The Reverend J. Gilbert Speake conducted the services at Seventh Street Baptist Church. Survivors are: seven sons, Troy, Fred, Louie, Rufus, Charles, Claiborn and Harold Glasscock; one daughter, Mrs. Pearlie Mae Thomas; fifteen grandchildren; five great-grandchildren; one sister, Mrs. Eli Davis and one brother, Eugene Harris. Pound loaf of bread, 15 cents at Brothers. Ad. The June 2nd Mystery Farm has been correctly identified as that of H.K. Tilley, of Route Four, Cullman. This 102 acre farm was previously owned by Mr. Tilley’s father, L.A. “Bud” Tilley. However, the present owner has been on the farm for the last 30 years. He has 75 acres in cultivation, on which he raises cotton, plants of various kinds, cattle, hogs and Shetland ponies. He does most of his farming by tractor, but some by mules. Before her marriage on April 19th, 1924, Mrs. Tilley was Maudie Gilland. 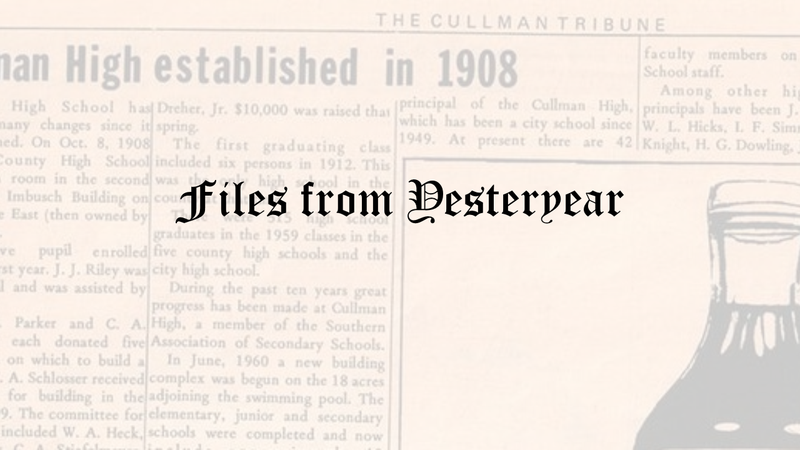 They have four daughters: Mrs. Charles Dunn, of Route One, Vinemont, Mrs. James Logan, of Birmingham, Mrs. Jack Nix, of Route Six, Cullman and Mrs. Ben Hoenig, of Columbus, Georgia and one son, Dwight Tilley, of Route Four, Cullman. The Tilleys are Baptist. He is a director of the Farmer’s Marketing and Exchange Association and she is a member of the Grandview Home Demonstration Club. Fishing, boxing and all sports are listed by Mr. Tilley as his hobbies, while Mrs. Tilley says that traveling is her hobby. Last summer the Tilleys enjoyed a long motor trip through 16 states and into Canada.